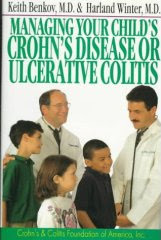 A large percentage of those people who have Chrones Disease are children, as well as a high percentage of people with Ulcerative Colitis are also children and it is not that uncommon to see an example of a child with Chrones at only 7 years old and it is thought that in all Chrones Disease cases, 20% are affecting children under 15. Chrones can have different problems for children, like Nutritional deficiency this is especially seriouse for children as they are still growing and Crohn's disease in children can actually lead to stunted growth. If you are a child with Chrones, your doctor may recommend nutritional supplements. There has also bee some recent research where children with Chrons disease have been helped with a growth hormone, this research is still in it's infancy, but the initial findings have been encouraging. There is no difference in the number of boys or girls that get Chrones Disease, but children who are born into a family with a history of the disease are far more likely to develop Chrones and possibly at an early age. Apart from the growth problems faced by children with Chrones disease, it is also very important to remember that a child with Chrones disease will have to face certain self image issues which can be particularly important for them at this time in their development. Chrones disease will separate them from normal child activities and therefore,these children will need a strong support base from their family, friends and doctors to help them not only with their physical health , but with their social and mental well being.